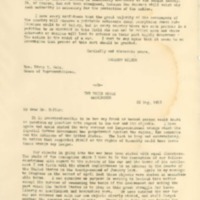 I have been very much surprised to find several of the public prints stating that the administration had abandoned the position which it so distinctly took, and still holds, that authority to exercise censorship over the Press to the extent that that censorship is embodied in the recent action of the House of Representatives is absolutely necessary to the public safety. It, of course, has not been abandoned, because the reasons still exist why such authority is necessary for the protection of the nation. I have every confidence that the great majority of the newspapers of the country will observe a patriotic reticence about everything whose publication could be of injury, but in every country there are some persons in a position to do mischief in this field who can not be relied upon and whose interests or desires will lead to actions on their part highly dangerous to the nation in the midst of a war. I want to say again that it seems to me imperative that powers of this sort should be granted. It is incomprehensible to me how any frank or honest person could doubt or question my position with regard to the war and its objects. I have again and again stated the very serious and long-continued wrongs which the Imperial German Government has perpetrated against the rights, the commerce and the citizens of the United States. The list is long and overwhelming. No nation that respected itself or the rights of humanity could have borne those wrongs any longer. Our objects in going into the war have been stated with equal clearness. The whole of the conception which I take to be the conception of our fellow-countrymen with regard to the outcome of the war and the terms of its settlement I set forth with the utmost explicitness in an address to the Senate of the United States on the second of April last those objects were stated in unmistakable terms. I can conceive no purpose in seeking to becloud this matter except the purpose of weakening the hands of the Government and making the part which the United States is to play in this great struggle for human liberty an inefficient and hesitating part. We have entered the war for our own reasons and with our own objects clearly stated, and shall forget neither the reasons nor the objects. There is no hate in our hearts for the German people, but there is a resolve which cannot be shaken even by misrepresentation to overcome the pretensions of the autocratic government which acts upon purposes to which the German people have never consented. Wilson, Woodrow, 1856-1924, “Wartime Censorship of the Press,” 1917 May 22, WWP20621, Woodrow Wilson Press Statements, Woodrow Wilson Presidential Library & Museum, Staunton, Virginia.